Sigmund Freud theorized that two forms of joking existed: innocent jokes and tendentious jokes. Each form has its own focus and a set of rules governing its construction. While tendentious jokes express some form of aggression, innocent jokes revel in a pure sense of the comic. That is to say, innocent jokes captivate the viewers’ mind by gently expressing the delightful and the absurd. It is the technique of the innocent joke, and not its focus on an aggressive outlet, that fuels our delight. In his work, Jokes and Their Relation to the Unconscious, Freud explains the power of the innocent joke: “On the basis of suitable specimens of innocent jokes, in which there was no fear of our judgment being disturbed by their content or purpose, we were driven to conclude that the techniques of jokes are themselves sources of pleasure” (1). Freud points out several important connections here. First, innocent jokes do not threaten the viewers’ psychic investment in the source of pleasure. In other words, they entice a listener by their sense of pure playfulness and wit. The listener delights in the innocent joke’s sense of play; at no time is the listener threatened by the joke. Second, it is precisely the lack of a sense of aggression and threat that underscores the pleasure that the innocent joke gives. The listener can relish the mental arabesques expressed without having to confront uncomfortable images. As Freud further asserts, “this enjoyment is no doubt correctly to be attributed to economy in psychical expenditure” (2). To some degree, then, innocent jokes are psychologically safe. Since the psychological “expenditure” involved does not intimidate the listener, he or she can enter into enjoyment of the moment. As we shall see, Charlie Chaplin creates a cinematic world where the innocent joke serves to focus of the tendentious comic intent. Thus, tendentious jokes have as their essence the need to defy authority and the need to relieve pent-up aggression that results from repressing emotions and thoughts. Tendentious jokes act as social stabilizers. Unlike innocent jokes, which derive their success from their technique of construction, tendentious jokes succeed best when they help displace repressed aggression. Tendentious jokes bring about a sense of overcoming the internal “obstacles to aggressiveness” (5) and this sense of psychic liberation brings about laughter. On the other hand, innocent jokes provoke laughter because their technique amuses the audience. The interrelationship between tendentious and innocent humour in Chaplin’s cinematic world helps to structure his comedy. In other words, Chaplin’s skilful blending of innocent and tendentious humour creates a cinematic world that has human appeal while also asserting social criticism. If comedy succeeds the closer it approaches tragedy, then Chaplin’s comedic form succeeds because it allows innocence to approach quite near to tendentiousness. Freud further discusses the technique behind these mistakes that children make. However, for our purposes, it is important to focus on the fact that similar things are treated as if they were exactly the same things. The nuances that compose the differing meanings of objects are misidentified and, therefore, lead us to laughter. In the same way, the misidentification of Chaplin – in the character of the Tramp as millionaire – drives the humour of the films, since the audience understands what has taken place while the other characters do not. Chaplin keys in on the essential truth of tendentious comedy as Freud defined it; tendentiousness functions as a vehicle of the secret resentment of the powerless or of the silent. As Chaplin realizes, “nine tenths” of the world’s population falls into one of these categories. However, one problem for Chaplin, as a comedian, was a successful career that hurtled him from poverty into wealth. How could Chaplin keep his comedy honest? The creation of the Tramp allowed Chaplin to combine the social criticism of tendentious comedy with the gentle irony of innocent comedy. Kuriyama further asserts that “art gave Chaplin control, not only of others’ feelings but also his own” (13). Both ideas, here – “crises” and “control” – serve to underscore the manner in which Chaplin conjoined innocent comedy with that of tendentious comedy. By allowing the character of the Tramp to mature from being tendentious, as in The Idle Class, to innocent, as in City Lights, Chaplin is able to produce a stronger social statement. That is to say, the more innocent characterization of City Lights serves to draw the audience into the cinematic world where they acclaim loudly the efforts of the Tramp on behalf of the blind flower girl – indeed, who is left dried-eyed at the film’s end? However, in their reaction to City Lights, audiences usually miss the fact that, essentially, they are viewing the same characterization of the Tramp that Chaplin created for The Idle Class – albeit a Tramp figure that has been ingeniously doubled with innocence. In fact, it is Chaplin’s skill in doubling the character of the Tramp with that of the character of a millionaire in both films that demonstrates exactly how Chaplin combined innocent and tendentious humour. Chaplin plays both parts in The Idle Class, leading to hilarious situations with misidentification. In this film, the characterization of the Tramp borders on tendentious humour that is reinforced by the actions of the alcoholic millionaire. Chaplin, in the role of the millionaire, has been informed by his wife, played by Edna Purviance, that his drinking is breaking up the marriage. The note she leaves informs the millionaire that she is leaving unless he quits drinking. The scene that follows is delightful in its tendentious qualities. 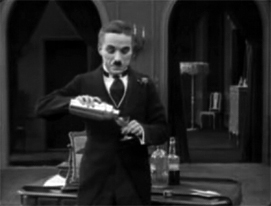 Chaplin is seen shaking heavily with deep emotion, which leads the audience to believe that the millionaire is crying, until he turns around and is seen vigorously shaking a cocktail mixer. The commentary on the state of marriage – with all its compromises, power struggles and identity issues – relates closely to tendentious humour, since most people in the audience would recognize marriage as a suitable subject for satire and irony, two strong components of tendentious comedy. Idle Class is “ambiguous” because it doubles the characters and blends innocence and tendentiousness, thereby making a much stronger commentary on society; we, as the audience, are indicted by the social commentary, while also identifying with the comic actions of the Tramp. As Kerr further demonstrates, it is this sense of “doubleness” (15) that drives the film with its speculations on identity and desire. Identity also plays an important part in creating the innocence of the film. The character of the Tramp arrives in the under-compartment of a train, carrying the accoutrements of the idle rich: his golf clubs. Since Chaplin plays both characters, the Tramp borders on innocence and tendentiousness. This dichotomy is most apparent during the golf game. The Tramp continually tries to steal the others players’ golf balls and ends up being chased around the green. While the Tramp’s pilfering may waver on the brink of tendentiousness, particularly as he tries to evade his victims, the character also expresses a form of innocence. When the Tramp steps on the obese stomach of a fellow golfer, a golf ball pops up from the fat golfer’s mouth. The repeated action brings delight, but the audience laughs more at the Bergsonian mechanical quality of the action than at any sense of displaced or unfulfilled urges. We simply delight in the visual repetition of the gag. The ambiguous nature of the tendentious-innocent dichotomy of the Tramp character comes to fruition during the mask ball. After being misidentified by the wife, the Tramp embarks on a series of slapstick misadventures that end with Charlie (as both characters), the wife and the father-in-law back in the couples’ apartment. The wife rejects the Tramp, although he treated her with the courtliness that she desired, when she realizes that he is indeed truly a vagrant and not just wearing a costume. She has her father throw the Tramp out, but then she changes her mind and calls for his return. The tendentious character of the Tramp asserts itself at this point as the Tramp kicks the father in the seat of his pants. Chaplin’s tendentious comment on high society seems to be quite clear at this moment in the film. As the Tramp runs down the garden path, the audience feels satisfied with the outcome. A blow has been struck for the dignity of common people against the disruptive and oppressive forces of wealth and power. During the film, the character of the Tramp has teetered between tendentiousness and innocence with a final dalliance with tendentious humour. 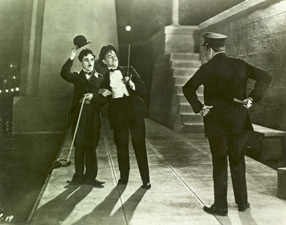 If The Idle Class leaves the tendentious/innocent dichotomy unresolved, then City Lights can be seen as the film in which Chaplin works out the relationship between the two forms of comedy and approaches most closely the concept set forth in this paper: tendentious comedy works best when it most nearly mimics innocence. City Lights repeats some of the same motifs that make their appearance in Idle Class. However, Chaplin redefines the Tramp-millionaire misidentification issue and reiterates the topics of theft and love. In the character of the Tramp in City Lights, Chaplin most clearly delineates the boundaries of the tendentious/innocent dichotomy as a vehicle of social satire. By making the Tramp a completely innocent character, as opposed to the mixture of tendentiousness and innocence seen in Idle Class, Chaplin makes his strongest exposition against the injustices of everyday life. Virginia Cherrill, as the blind flowergirl, mistakes the Tramp for a millionaire when she hears the door to a limousine shut. She assumes that Chaplin, who has left his change, drives off. This one mistake drives the action of the film, since the Tramp enjoys impersonating the millionaire. 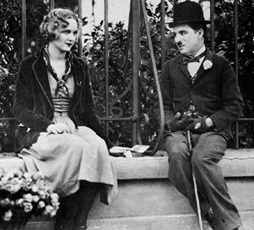 Whereas Chaplin plays both characters in Idle Class, the separation of the millionaire/tramp character in City Lights allows Chaplin to indulge in total innocence. 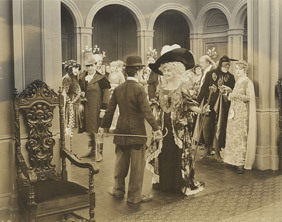 It is the characterization of the manic-depressive and drunken millionaire that drives the tendentiousness of the comedy, and the separation of tendentiousness in one character and innocence in another permits the audience to completely identify with the noble actions of the Tramp, as he struggles to gain money to help the blind flowergirl. While Chaplin demonstrates that the Tramp enjoys the fantasy of appearing to be rich, Chaplin also takes pains to show that the Tramp has nobler aspirations. This fact is most clearly seen when the Tramp steals the money that the millionaire initially offered while drunk. Since the millionaire cannot remember offering the money, the Tramp is accused of theft and sent to gaol. His suffering for the girl highlights the innocent nature of the Tramp and most clearly demonstrates how effective innocence can be as a vehicle of tendentious social commentary. 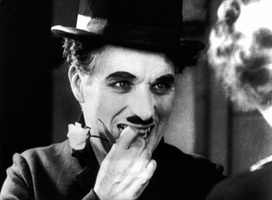 Since the Tramp has been removed from any connection to true theft, unlike the more ambiguous version of the Tramp in Idle Class, Chaplin can draw on the audience’s sympathy for his travails. That is to say, while the audience can laugh at the mechanical quality of such scenes as the Tramp trying to win a boxing match, they can also be moved to pity at the end of the film when they see the Tramp standing in his rags before the woman that he loves. The tendentious/innocent quality of the film works because the audience is forced to realize the part it plays in perpetuating petty daily injustices, as demonstrated by the black screen at the end of the film. At the same time, in the character of the Tramp, Chaplin provides the audience with a hero who also mirrors the more noble aspirations of the viewers. The tendentious/innocent dichotomy demonstrated in such Chaplin comedies as The Idle Class and City Lights reveals the nature of Chaplin’s filmic genius. He creates a comic world that twists the audience’s expectations of reality in such a manner that viewers can incriminate themselves in the inequities of daily life while also finding a hero who personifies their highest ideals. By using the tendentious/innocent polarities, Chaplin fulfills the ancient rules of comedy that require it to remark on the vagaries of human existence while also portraying the life force that brings hope to the audience. City Lights (Charlie Chaplin, United Artists, 1931.) Performers: Charlie Chaplin and Virginia Cherrill. The Idle Class (Charlie Chaplin, First National Films, 1921). Performers: Charlie Chaplin and Edna Purviance. Freud, Sigmund, Jokes and Their Relation to the Unconscious, translated and edited by James Strachey (New York: W.W. Norton and Co., 1960), p. 146. Quoted in David Robinson, Charlie Chaplin: Comic Genius (New York: Harry N. Abrams Inc., 1996), p. 115. Brian Gallagher, “Chaplin, ‘Charlie,’ and (Dis)pleasure”, North Dakota Quarterly, 56.1 (1988), p. 165. Claudia Clausius, The Gentleman is a Tramp: Charlie Chaplin’s Comedy (New York: Peter Lang, 1988), p. 34. Henri Bergson, “Laughter”, in Wylie Sypher (Ed. ), Comedy (Baltimore: The Johns Hopkins UP, 1956), p. 186. Morris Dickstein, “Urban Comedy and Modernity: From Chaplin to Allen”, Partisan Review, 52.3 (1985), p. 272. Constance Brown Kuriyama, “Chaplin’s Impure Comedy: The Art of Survival”, Film Quarterly, 45.3 (1992), p. 26. Walter Kerr, The Silent Clowns (New York: De Capo Press Inc., 1980), p. 186.